Shal or Sal (shorea robusta, family: dipterocarpaceae) is a large and deciduous robust tree with straight trunk and few branches at the top, usually 20-40 m high. Wood is reddish brown. 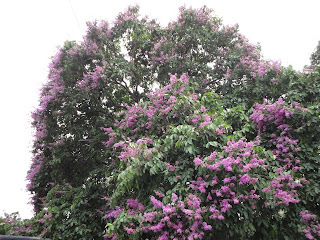 The tree is found in Gazipur, Tangail, Mymensingh, Dhaka, Dinajpur, Rongpur and Comilla in Bangladesh. Leaves are simple, alternate, glossy green, leathery, ovate-oblong with pointed apex, base rounded or cordate, 15-20 cm and 5-10 cm wide; petioles 2 cm. long. Flowers are very small, petals 5, yellowish orange, soft and hairy, borne on large panicle. Flowers blooms in March-April. Fruit is brown-colored nut with 5 unequal linear wings, 5-7 cm long. propagated by fresh seeds and also from newly grown seedlings those grown from the base of the tree. For this reason, Shal is also called Gojari. Shal is a commercial timber tree in Bangladesh. Its timber is robust and used as pole, boat, railway sleeper, furniture. Burning leaves produce a kind of aroma. So cigar can be made from its leaves. Fat obtained from the seeds are used to cook and to make chocolate. The tree is so handsome that it can be used as shade-giving tree beside roads and borders of large gardens. Juvenile Shal trees in the winter. Its leaves are used in white leprosy, blood dysentery, diabetes and gonorrhea. Its seeds are used as aromatic resin. Bangladesh and India are the original home of the plant. Shal-forest occupies about 30 percent of the country's forest area. But due to mismanagement, the forests are being destroyed day by day.